In the creation of a sound piece, I’m looking for an imaginative use of the raw material, the chosen sound sources, or prescribed themes at work. This involves hearing the inherent rhythms, textures, melodies within a sound, and then listening even closer to hear the sounds within the sound. That’s where creative intuition takes over – how can i manipulate that sound, that sample to express the musical idea i have in mind? Here’s where the real work begins. Being able to translate those ideas into the world for an audience. For this, I rely on my background musical knowledge, and experience with effects pedals, synthesizers and the like to morph each sound into its new form, into a melody, rhythm, texture that fills the appropriate aural space, playing its role with and against the other sounds at play. Sound and music are a realtime experience. Experienced, perceived, and interpreted in your own personal manner, and station in life. Each experience is unique. The piece I’m listening to now will not affect me the same way in two days as it is at this moment. I’ll have memories of what I felt, and possibly try to recreate them, but they will only be a reimagining of those feelings. So how can I as a sound artist best convey my intent through a form that is at it core temporary? 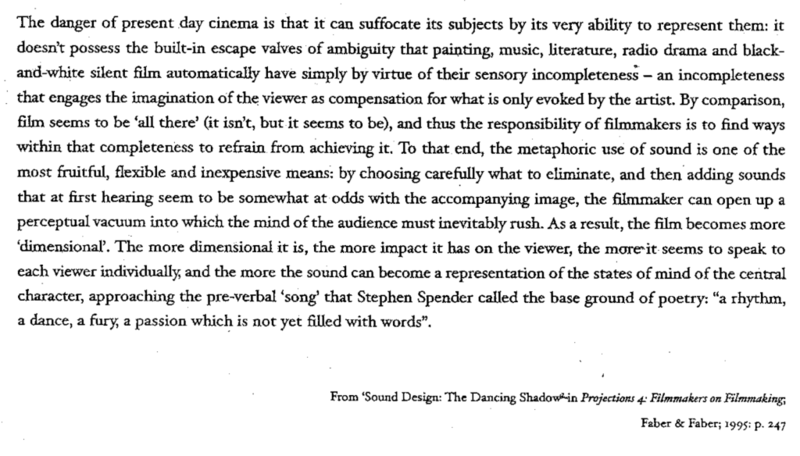 Voegelin suggests a few themes to focus on while creating and/or experiencing sound art: subjectivity, objectivity, communication, collective relations, meaning, and sense making. Reading the following article gives a wonderful insight into how Murch balances sound in his work, and verbalizes an approach that sound artists of any ilk can work with as a framework for their endeavors.